Chinese officials had been trying over months by means of threats to deter their Tibetan Buddhist population from engaging in the Kalachakra festival, being performed by the Dalai Lama himself at the place of the Buddha’s enlightenment in Northern India. Nevertheless, his devotees showed themselves unimpressed, gathering in private places, not only in Tibet itself but also in the Chinese provinces of Sichuan and Qinghai, to follow their spiritual leader’s discourses, engage in prayers and perform acts of kindness to gather merit. Religious observances and prayers held to coincide with a major Buddhist gathering in India are spreading in Tibetan areas of China in open defiance of authorities’ warnings not to take part, sources in the region say. Chinese authorities have called the Kalachakra teachings being led this month by exiled spiritual leader the Dalai Lama “illegal” and have threatened punishment for Tibetans spreading news of the event or organizing local ceremonies in support. 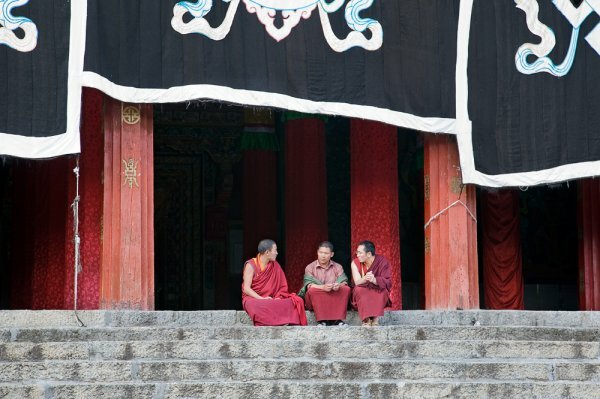 Residents of at least one Tibetan-populated county in Sichuan have been gathering in small groups to pray and to listen to the Dalai Lama’s teachings on the internet, though, a local source told RFA’s Tibetan Service. “Tibetans living near Gyarong Trochu Thukje Chenpo, a sacred place in Barkham [in Chinese, Ma’erkang], have been participating in large-scale meritorious activities, including saving animals’ lives, during the period of the Kalachakra teachings,” RFA’s source said, speaking on condition of anonymity. “They have also shared videos of the Dalai Lama’s teachings over social media, translating them from the [Dalai Lama’s] Central Tibetan dialect to the local dialect so that people can understand,” the source said. “Several hundred elders have also gathered to recite mantras and say other prayers,” he said. Activities supporting the Kalachakra are also under way in Tibetan-populated counties in neighboring Qinghai, with residents defying official warnings by fasting, praying privately in their homes, and freeing animals destined for slaughter, Tibetan sources told RFA this week. With preliminary teachings already under way in Bodh Gaya, India, Chinese officials and police went on Jan. 3 to Tibetan monasteries in Gansu province’s Machu (Maqu) county to warn the monasteries’ management committees against involvement in related events, another source told RFA. Machu residents who had been detained following region-wide Tibetan protests in 2008, and who were later released to their homes, were also directed to report to county authorities between Nov. 1, 2016, and Jan. 1, 2017, RFA’s source said, also speaking on condition he not be named. “They were told that anyone caught doing these things would be detained and face severe punishment,” he said. Kalachakra, which means Wheel of Time, is a ritual that prepares devotees to be reborn in Shambhala, a celestial kingdom which, it is said, will vanquish the forces of evil in a future cosmic battle. The ceremony and teachings are often conducted outside Tibet by the Dalai Lama, who is widely reviled by Chinese leaders as a “splittist” seeking to separate Tibet, which was invaded by Communist China in 1950, from Beijing’s control. In a bid to reduce attendance at this year’s ceremony, Chinese officials moved beginning in November to confiscate the passports of Tibetans authorized to travel abroad, at the same time ordering Tibetans already present in India and Nepal to return home. Many had been told their families would be harmed if they failed to go back, sources told RFA in earlier reports.